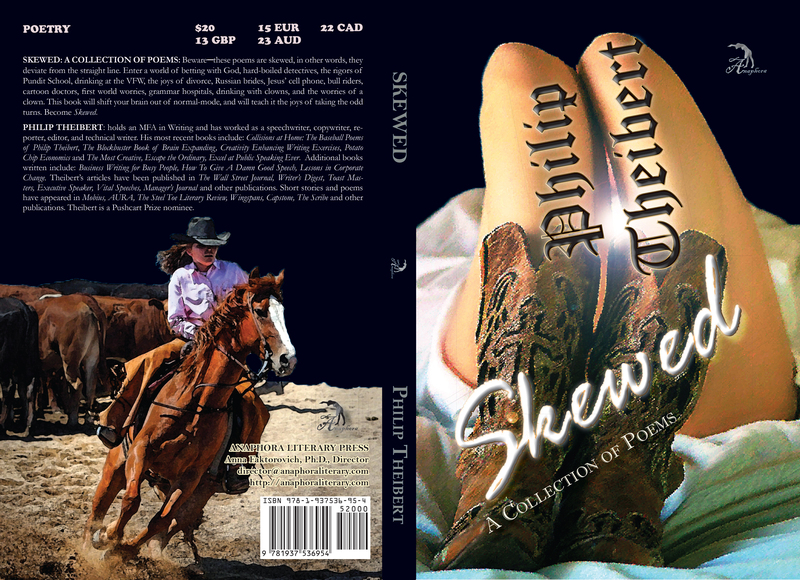 Skewed: A Collection of Poems: ($20, 6X9″, 232pp, ISBN: 978-1-937536-95-4, Hardcover ISBN: 978-1-68114-118-3, LCCN: 2014919151, October 31, 2014; Purchase on Amazon or Barnes and Noble): Beware─these poems are skewed, in other words, they deviate from the straight line. Enter a world of betting with God, hard-boiled detectives, the rigors of Pundit School, drinking at the VFW, the joys of divorce, Russian brides, Jesus’ cell phone, bull riders, cartoon doctors, first world worries, grammar hospitals, drinking with clowns, and the worries of a clown. This book will shift your brain out of normal-mode, and will teach it the joys of taking the odd turns. Become Skewed. Philip Theibert: holds an MFA in Writing and has worked as a speechwriter, copywriter, reporter, editor, and technical writer. His most recent books include: Collisions at Home: The Baseball Poems of Philip Theibert, The Blockbuster Book of Brain Expanding, Creativity Enhancing Writing Exercises, Potato Chip Economics and The Most Creative, Escape the Ordinary, Excel at Public Speaking Ever. Additional books written include: Business Writing for Busy People, How To Give A Damn Good Speech, Lessons in Corporate Change. Theibert’s articles have been published in The Wall Street Journal, Writer’s Digest, Toast Masters, Executive Speaker, Vital Speeches, Manager’s Journal and other publications. Short stories and poems have appeared in Mobius, AURA, The Steel Toe Literary Review, Wingspans, Capstone, The Scribe and other publications. Theibert is a Pushcart Prize nominee.